In the process of watching a film like "Martha Marcy May Marlene" there is a feeling of unraveling that comes with it that leaves you in a tense state throughout. I was happy to see the film finally make it to my neck of the woods as I have heard so many great things about it. Still, with having heard much about it I was not familiar with what exactly the film was about. All the raving had mainly pertained to Elizabeth Olsen's performance (well deserved) and the accolades it was racking up at film festivals. In some ways I expected the tone of last year’s festival darling "Winter's Bone" to be present here and while this film does incorporate some slight southern gothic-esque staples it is more a movie that exists in two polar opposite realities. The line between those realities and where our protagonist actually exists within them is the subject of the film and it keeps its audience always alert and on its toes. As the anchor of the film this is certainly a great start for Olsen who immediately dismisses any negative assumptions that she is not an actress to be taken seriously just because she shares the same last name as the twins who played Michelle Tanner. The film is expertly paced and we receive just the right amount of information in the right increments as it moves along as well. 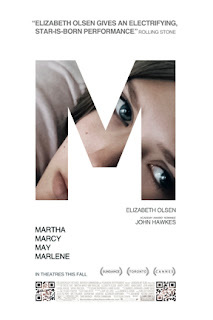 Olsen plays Martha, a young woman who is essentially haunted by memories of her time spent in a cult while she tries to reconnect with her sister and become a normal member of society. The paranoia of what fleeing the cult could mean in terms of repercussions though keeps her permanently damaged as if unable to move on. We are introduced to Martha, or as she is referred to by other members of the cult, Marcy May, as she escapes. We know little of what has gone on, what she has been involved with or how she even came to be there. It is clear it isn't normal though; the opening still shots of men working outside as the women cook then proceed to watch the men eat from upstairs as they wait their turn. It is very subtle in its disturbances, but writer/director Sean Durkin knows the effect he is going for, he knows what he wants you to feel, even if you don't want to. And that is exactly the result of his work when combined with Olsen's performance which begs for you to care about Martha. You give her your sympathy and you are repulsed by what she has been through, but you are just as scared of her and what she might do as her sister is. (Sarah Paulson) to pretty her up for a party. The real trick of the film though is the way Durkin and his editing team have composed the film. As if it were Martha's dreams they run the two worlds together. Sometimes to the point we too are unaware at what state Martha is in. Is she safe with her sister and husband at their lake side house or is she still trapped by the brainwashed men and women of this community. The lines blurring between what is real and delusion are not only in Martha's mind but in the technique, the audience begins to experience it as well. This only strengthens the narrative that is careful not to give us any more than we need to know. It keeps us constantly is a state of unease and honestly ends up being one of the best thrillers if not films of the year. Helping to reach this status though is not just the titular performance by Olsen but also that of John Hawkes who plays Patrick, the extremely charismatic leader of the cult. Hawkes (who was also in "Winter's Bone") has been playing small parts with big impact for years now but unlike before, this character has to make us believe people would actually follow him. That a person like Martha who seems intelligent if not slightly awkward and innocent, would buy into his game and philosophy. As Patrick, Hawkes pulls off the commanding yet quiet man who can you enough fancy words and clever phrasing to make you believe anything. He is flawless and as much as I could shower Olsen with praise, her performance would feel more loony and less credible if it were not for the one Hawkes delivers. This is a dark, serious film that is also among a few that have truly affected me this year. It is a silent, slow burn that like a bad car wreck you can’t look away from. The story is engaging and mysterious while the characters are full and relatable. We could see ourselves becoming a part of something we fear. We wonder what would we do were we put in Martha’s sisters position. Mostly though, we want more from it. Unlike most films today, instead of showering us with over explanation or unnecessary backstory, “Martha Marcy may Marlene” almost feels like it is holding out on us, demanding we pay attention to it. Some people will not like how abrupt the film ends, but in an odd way it fits perfectly with the rest of the film. There is seemingly no beginning, middle or end to the film, instead this is just a piece of someone’s life, albeit fictional, that happened to be going through a serious trauma in trying to discover who she is and if it is possible for her to begin again. You will wonder if that really is the end of the film, but trust me, it is, and you will then debate it on the ride home. All I will say is that I was so wrapped up in the journey of it all I wasn’t even ready to ask if we were nearing the end. It simply happened and hours later, I am still thinking about the film.